Pot taxes might not be enough to fund street upgrades in even one block, like this one downtown. On Facebook, Albany’s borrowing $8.4 million from the state for downtown street upgrades drew this comment: “Maybe they should have pot sales and we would get that much from the $44 MILLION IN TAX REVENUE.” It’s a common sentiment and assumption. But whatever else commerce in cannabis would mean, a gusher of city tax receipts is not going to be it. Oregon announced last week it had taken in $40.2 million in marijuana tax payments since January. This represented the 25 percent state sales tax on recreational pot sold by medical marijuana dispensaries. Third-quarter pot tax returns aren’t due till Oct.31, so the $40 million may represent just two quarters of receipts and the annual take may be double that. Quite a chunk of money, but the state plans to keep whatever it costs to administer the marijuana tax. After this year, the sales tax on recreational marijuana drops to 17 percent, and medical marijuana remains untaxed, as now. The amount of revenue left over after the state takes its cut will be distributed as follows: 40 percent to the common school fund, 20 percent to mental health and drug services, 15 percent to the State Police, 10 percent each to counties and cities for law enforcement, and 5 percent to the Oregon Health Authority. So if voters overturn the existing ban on recreational pot sales in the city, how much would Albany get from the cities’ overall share of 10 percent of the state tax? Hard to say because each city’s share would be based on the number of licensed recreational pot shops locally and statewide. Mayor Sharon Konopa, who opposes recreational pot commerce in the city, did some calculations based on four local dispensaries and 400 statewide, and came up with $72,000 a year. Add the 3 percent local sales tax on recreational pot, which also is on the Albany ballot, and the total grows to a hypothetical $92,400 a year, which Konopa notes is not quite enough to cover salary and payroll costs for one police officer. One finds it amusing that the mayor, along with Councilor Kellum, pooh-poohs pot sales because the taxes wouldn’t even pay the salary of one police officer. This reveals the mayor’s real motivation. Taxes on alcohol probably don’t provide a great deal more, yet one does not hear objections from the City fathers and mothers as to the sale of demon rum within Albany confines. Based on the mayor’s logic, unless we can recoup the cost of police officer’s salary and benefits, the revenue source is simply not worth pursuing. But the mayor’s argument misses the point. Legalizing marijuana was never about tax revenue to the City’s pitiable coffers. The freedom to live one’s life as one sees fit is all the reason to legalize cannabis that is necessary. Whether the mayor can pay a cop is a silly distraction indicating absolutely nothing. I agree. The issue of revenue, regardless of how small the amount is, must be considered. I think Profumo’s point about the small-town attitudes which color the thinking of our leadership is the more important one. Albany’s mayor, along with some sitting Councilors, believe that they are better suited to judge what’s good for citizens. Their position regarding recreational cannabis sales in Albany is made all the more bothersome by the fact that the Albany electorate approved Measure 91. In short, the City Council directly betrayed the wishes of it’s citizens. This betrayal is enough for Albany citizens to reject those who fail to listen to the voters. I support the legal sale of MJ, but when you start talking about “betrayal” of citizens you’re going way too far. Easy enough to go to Corvallis or Salem or Eugene which lots of folks often do. Inconvenient? Yes. Betrayal? Not even close. That said, what seems to have been missing is the fact that additional businesses in town will require contractors to build them, sales at local hardware stores for materials, etc. In addition, the fully built establishments will be having decent paying jobs (way above minimum wage), and that payroll will roll through the community as all payrolls do — generating more sales in town, etc. Let me also hazard a guess the new buildings will increase the property taxes for said location if they are, in fact, new and/or a major improvement of the existing facility. Will some of the new business fail? Probably… I just do not want to stand in the way of new businesses trying to get started when some folks whine & complain about Albany not being “business friendly.” Hello?! Yet when it came to the levy for the new police station, you claimed it wasn’t a tax increase when the “official” city budget stated it was. You can’t have it both ways, Ray. Yes, Hasso. Now we’ve examined it and found it to be insignificant. The freedom to live one’s life unmolested by government is by far the more important issue, so now we can ignore the tax thing and move on. Wait so Albany get enough revenue to hire at least half a cop and has less crime to patrol in black market pot sales? Seems like a win-win. Do the elected city leaders consider themselves to be representatives of the people or sovereigns? Concerning the cannabis issue, it appears the latter. So about half of Ward I voted for pot and one of two councilors voted that way; in Ward II about half of the voters voted for pot and one of two councilors voted that way. In my Ward III most voted against pot and both councilors voted against it. It passed in Albany by 400 votes after failing multiple times and every single time in Ward III. Betrayal? Really? If so, wasn’t it betrayal for the pot folks to keep bringing it up after it kept failing? One set of standards would be nice. True, it was not “betrayal” at any point in the process. It is the gold standard of process. If you don’t agree with the outcome, step back, marshal your constituents, and try again. However, in this particular case, because council chose to override the will of the voters, Albany was mandated to have this on the ballot again. Guess what? If our prohibition is voted in – again, I’ll step back, wait a bit, and try again. It’s the American way. I wouldn’t have it any other way. Absolutely Mr. K. Attitudes towards MJ have changed dramatically over the past 20 years. This is even true in conservative, little Albany. Interesting piece here breaks down the change in attitude by demographics. Last hold out …drum roll please… the silent generation. The national presidential election was settled with 437 Florida votes, (pregnant chads and Supreme Court ruling aside), without a second ballot required. Locally, Measure 91 was adopted as law by the city voters with a similar margin and the elected city leaders require a second ballot to affirm the issue. Do the elected city leaders consider themselves to be representatives of the people or sovereigns? Concerning the cannabis issue, apparently the latter. When the wishes of Ward 3 happen to align with the personal preferences of his lordship, Kellum is proud as punch to show how he is really only focused on his constituency. His hypocrisy is as tedious as his alleged dedication to Albany. There is substantial money related to the legalization of marijuana. I think it is short sighted of Albany to say we don’t need the small (?) amount of money given back to Counties because it is not enough. It may not pay for more than one of our policemen but we already fund our law enforcement through other means. $100,000 annually would go a long way for our parks department. Our missions and shelters wouldn’t scoff at the money either. Is it HOW much money we would get or the short sightedness of our leaders to put new money to good use? And will Albany receive ANY if the millions taken in by the State? If not, we have turned down school improvements and growth and so very much more. Walk into a dispensary. They are safe, well maintained, professional and friendly, thriving businesses. Just not in Albany. We are too good for even a little more money for some creative projects. That’s probably because Albany is so innovative in funding. I’m sure we have hired professional grant writers for our schools, roads, parks and other improvements so we’ll be rolling in the dough anyway. 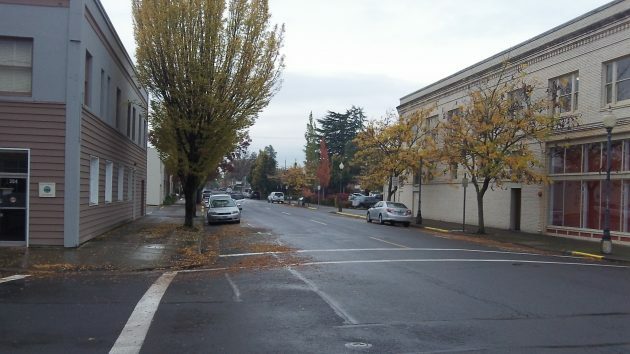 What constitutes a “City” in Oregon? Is there some definition of “City”? Is Shedd a City, How about Waterloo? Burnt Woods? Beaver?, etc. Albany receives roughly $50,000 a month from the OLCC from the sale of alcohol in this state. Perhaps it’s time we go completely dry and close the alcohol establishments and give back that revenue, too. Freedom for all, or freedom for none.